Boy, it's getting dark quick these days. Time to bust out the lights and go into stealth mode for the weekday riding. No legal nighttime singletrack here in MD and there were plenty of reports of tickets being issued last year. With a little common sense on route selection and timing we've been able to avoid them and I plan on keeping it that way. On Wed. we barely had 1.5 hours of daylight. Coupled with my broken chain and another rider's flat, it definitely put a crimp in our mileage. Time to burn the torches on the trail. Lots more pictures from the SSWC2004. Attention-deficit hyperactivity disorder, which affects about 3 to 5 percent of U.S. children, may be alleviated with a simple treatment: outdoor activity in green areas such as parks, farms and even backyards. A study of 452 parents of children with ADHD, to be published in the September issue of the American Journal of Public Health, showed that activities in natural settings seemed to calm the children; afterward they were better able to focus, listen and follow instruction. The findings have "exciting implications," the researchers say, and suggest that "green" time could help many children -- and even reduce their need for medication. Kids playing outside? What a radical notion. Spent a few days off of the bike kicking back in flatland Florida. I was jones-ing to ride, but not nearly as much of a withdrawal as I thought it would be. Substituted lounging around and drinking cold beers by the water for pedaling, so maybe that helped. Red Stripe and Fosters oil cans seemed to be the best choices most spots offered. 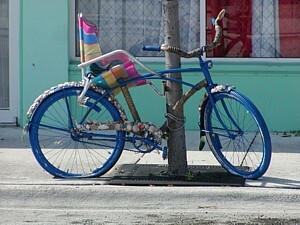 Spotted a couple of cool art bikes while I was down there and saw plenty of people churning circles on the road. TT bars are big on the road bikes and bar ends pointing towards the sky on the "MTBs" seem to be the norm. All and all a bit of a strange world to me but different can be good. At least for a few days.